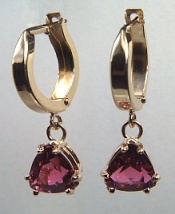 Shown: 6 x 4 mm emerald cut garnets set in 14KY lever back scroll mountings. We offer this style mounting for most any shaped gemstone. 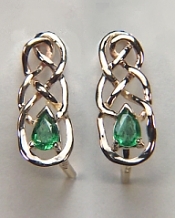 Celtic motif earrings in 14kt yellow gold adorned with .30ct pear shaped emeralds. This design has a hidden lever back closure and measures 22mm in height. 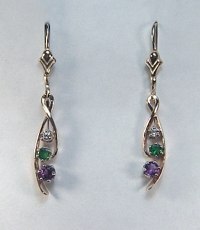 Visit our Celtic Jewelry page for other ideas. Shown: Platinum and 18KY mountings with locking Eurowire closures. 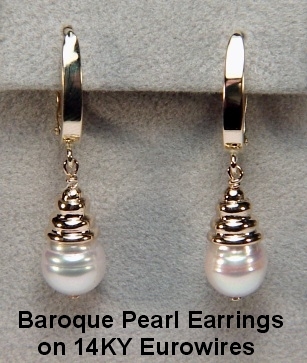 We will gladly create similar custom earrings just for you. We have a wide range of gemstones to choose from including tanzanite, imperial topaz, tsavorite garnet, bi-color tourmaline, rubelite, colored sapphire (yellow, green, pink and blue), Celyon sapphire, ruby, emerald, diamond, opal and more. 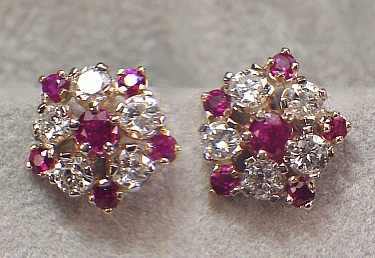 Visit our In Stock Diamonds and Gemstones page to view our current holdings.